The fifth at Black Lake is a 235 yard par 3. An updated Black Lake Golf Course Review is at the link. Black Lake is as pretty and enjoyable a course as you will ever want to play. 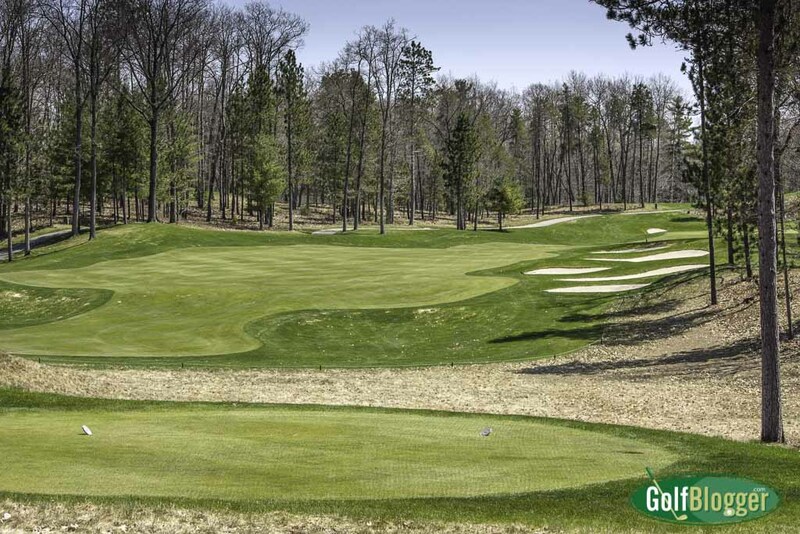 Built across three hundred acres of Northern Michigan pine, hardwood and marsh, it’s ranked by GolfWeek as Michigan’s ninth best, as number 34 on Golf Digest’s Top 100 You Can Play, and appears on many other “Top” lists. Those accolades are well-deserved. Each hole at Black Lake is as pretty as a postcard, and I have only rarely found a course where every one was worth playing. Even better: after playing three times in three days, I found the course revealed something different each time. 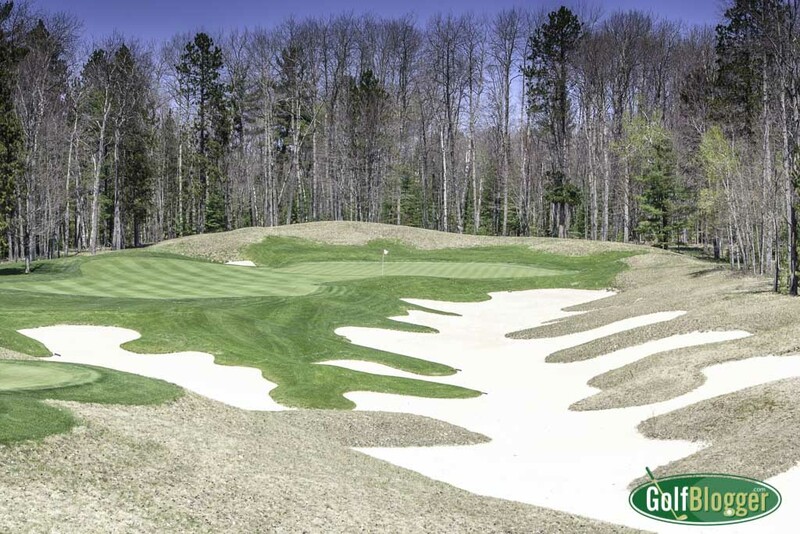 At 7,046 yards from the tips, Black Lake is a big course and a challenging one, but fair. Fairway bunkers abound, but the landing zones are generous. Other than a couple of par threes, there are no forced carries to speak of. The course was, I found by the third playing, less about hitting it long than about hitting the right locations. The sixth at Black Lake is a 375 yard par 4. Even the most brutal of par threes has a way out. At 235 yards, the par three sixth is the courses’ signature hole. At first glance, the hole is set beyond a frightening chasm, guarded at the bottom by a long of a waste bunker. On the first play, I pulled out a driver and tried to smash the ball over the dragon and land it on the safe green beyond. I failed, and the ball was swallowed. Upon walking up, though, I discovered that I had been distracted by the danger. Running to the left of the chasm is a think stretch of fairway, and a landing area that shortens the carry by forty yards. (its more obvious in the photo than it is in person) On subsequent playings, I parred the hole by hitting an iron to the left, which left me a pitch and putt. The eighteenth at Black Lake is a 590 yard par 5. My favorite hole actually was the eighteenth. 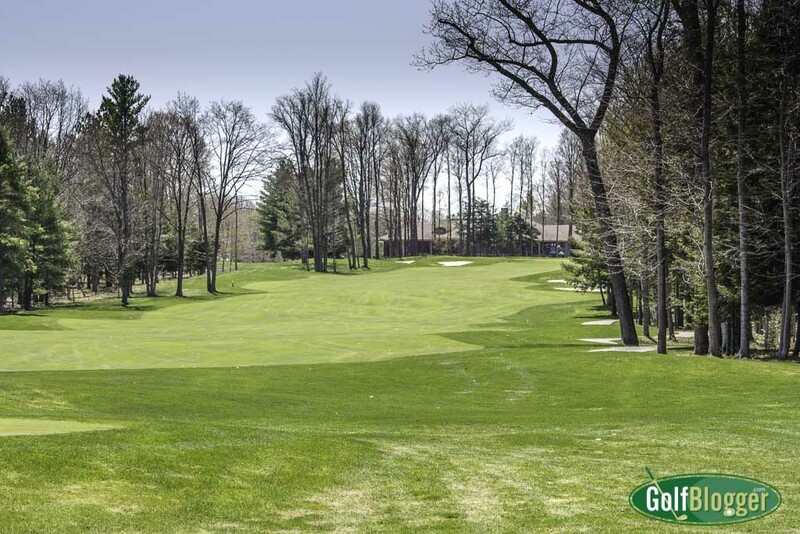 From an elevated tee, the tree lined fairway sweeps down and slightly right, the up again to the green. A fairway bunker lies midway on the right, and two others surround a two tiered green. But my appreciation for the first is not meant to devalue any of the others. I truly enjoyed each and every one. It’s worth mentioning that there are any number of rumors surrounding the course. It’s true that Black Lake is owned by the United Auto Workers. Their gearlike logo (it’s actually people holding hands in a circle) is on the tees on every hole, and other places as well. And it’s true that the Course adjacent to the union’s Walter and May Reuther Family Education Center. But you don’t have to be a union member to play. The course is open to all at very reasonable rates. There are no Union security at the course gates (although security is all over the Education Center). And no one checks to see if you are driving an American car. The only downside to the course is its location. “Up North” in Onaway, Michigan, it’s well off the beaten track. You have to make a special effort to play the course. But it’s worth it. You can see more photos of the course below. The fourth at Black Lake is a 454 yard par 4. The seventh at Black Lake is a 422 yard par 4. The eighth at Black Lake is a 182 yard par 3. The fourteenth at Black Lake is a 206 yard par 3. Black Lake's fifteenth is a 515 yard par 5. The sixteenth at Black Lake is a 443 yard par 4. Black Lake's seventeenth is a 392 yard par 4.